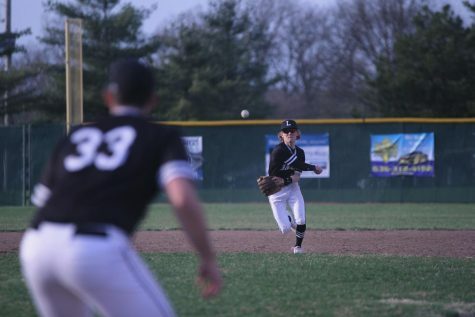 During the April 6 baseball game against Westminster, junior Zach Bryce rounds second base. The Lancers defeated the Wildcats 8-0 to improve to 6-0 on the season. 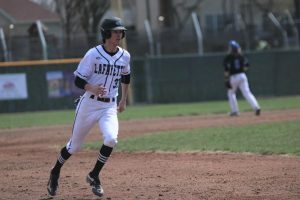 Baseball: On April 1, the baseball team hosted and defeated Parkway West 9-1. On April 2, Lafayette traveled to Oakville where they won 6-5 after trailing for the first 6 innings. Over the weekend, they played two games. For the first game, they hosted Washington, where they won 11-0. The afternoon game was against Westminster where they won 8-0. Their record is 6-0, and on April 9, they will host Lindbergh, and on April 11, they will host Kirkwood at 4:30. To finish off their week, the baseball team will have a doubleheader against Francis Howell North at 11 a.m. and at 1 p.m. Boys Golf: On April 2, the boys golf team defeated Webster Groves and Seckman. Senior Max Kreikemeier placed first overall as he shot two under par with 34 strokes. On April 3 at the St. Albans Golf Course, the Lancers defeated Parkway South 251-272. 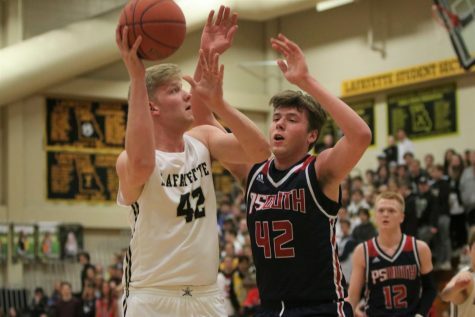 The Lancers will compete in the Fort Zumwalt South Bulldog Battle on April 8, and on April 9, they will take on Eureka at the Legends Golf Course. Boys Lacrosse: On April 2, the boys lacrosse team defeated Parkway South 15-6, at Crestview Middle School. Their game on April 4 against DeSmet, was postponed until a later date due to rain. 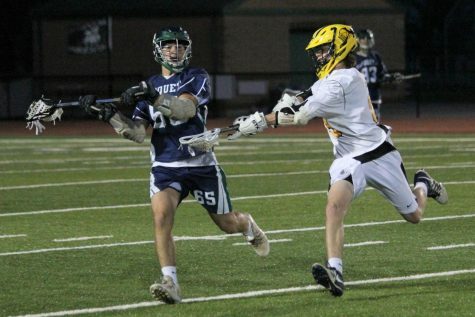 This week the boys lacrosse team will play on April 8 at Holt at 7 p.m. Then on April 10 at 7:30 p.m, they will host Marquette High School at Crestview Middle School. 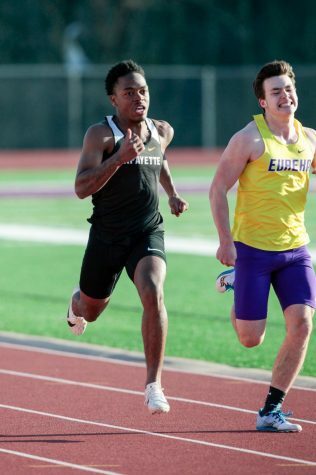 To finish off the week, they will go to Eureka on April 12 at 7 p.m.
At a meet at Eureka on March 26, junior Antonio Cooper competes in the 200 meter dash. 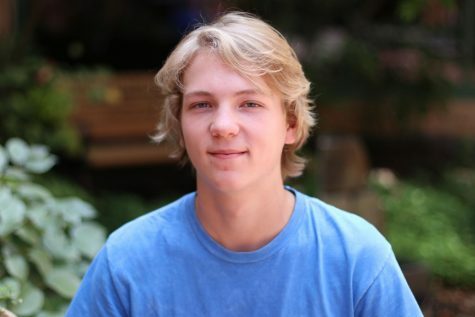 Boys Tennis: In the first week of their season, the boys tennis team went 2-1. The Lancers defeated Parkway West 6-3 and Eureka 8-1, but they fell to Chaminade 7-2. 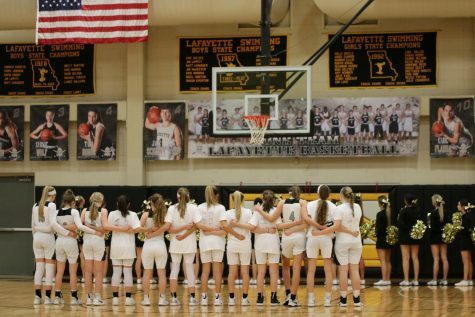 The team will play their first home game on April 9 at 4:15 p.m. against Lindbergh before traveling to Eureka on April 10 and April 11 to compete in the Eureka Doubles Tournament. Boys Track: The boys track team claimed the first place title in the Northwest Invitational on April 7. The 4×100 meter relay team of juniors Marsean Fisher, Gavin O’Neil, Caden Phipps and Jonah Robinson and the 4×800 meter relay team of seniors Harrison Brown and John Nicholson and juniors Aiden Murphy and Aiden Murphy placed first in their respective races. Phipps also claimed first place in the 100 meter dash while Pate placed first in the 400 meter dash. Boys Volleyball: On April 1, the boys volleyball team traveled to Fort Zumwalt South and won the first two sets to defeat the Bulldogs and improve their record to 4-4. 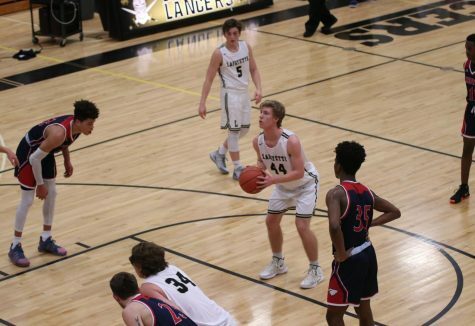 Then on April 2, the boys hosted Parkway West, where they won the first and third set defeating the Longhorns. To finish their week, they hosted Parkway South and won in the first two sets. 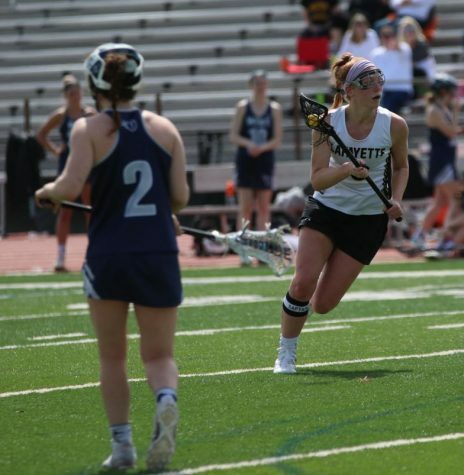 Girls Lacrosse: On April 2, the girls lacrosse team defeated Parkway West 13-5. On April 4, the girls played at Eureka and won 14-5. 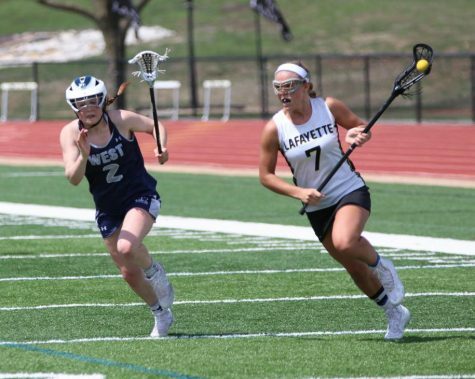 For the 2019 Wildwood Shootout, the girls hosted Shawnee Mission and defeated them 12-5. The next morning, the girls hosted Notre Dame de Sion, and won 14-2, and they hosted Lee’s Summit West and won 11-3. This start helped to propel the girls to a 10-0 record. On April 9, the girls lacrosse team will travel to MICDS for a 4:30 p.m. game. The girls will then travel to Cor Jesu on April 11 for a 4:30 p.m. game. Running up the field in the April 6 game against Lees Summit West, senior Katherine Goddin looks to pass the ball. 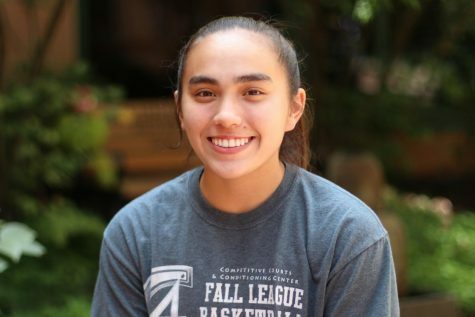 In the win 11-3, Goddin scored 8 goals to become the leading scorer in the St. Louis area with 37 goals and 47 points. Girls Soccer: On April 1, the girls soccer team hosted and defeated Hazelwood West 5-0. 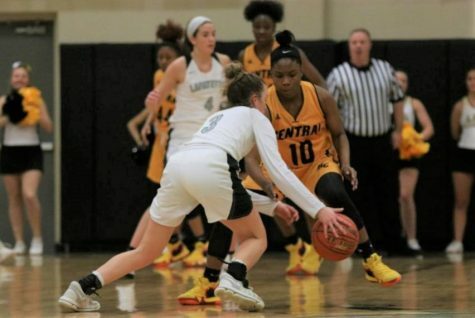 On April 2, the girls hosted Borgia and defeated them 10-1. 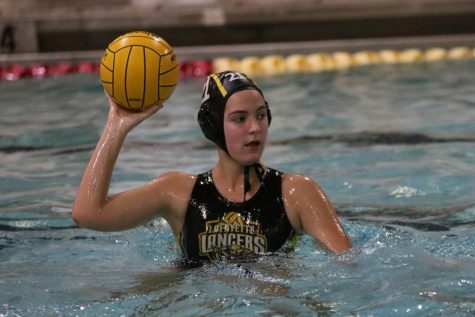 The Lady Lancers finished their week by hosting Lindbergh, and defeating the Pioneers 3-0. This week, the girls will host Kirkwood on April 10 at 4:30. Girls Track: The girls track team placed third in the Northwest Invitational. Senior Anna Karner finished first in the 1500 meter run with a time of 4:51.31, and Karner’s 4×800 meter relay team consisting of junior Grace Kirtley and sophomores Kelsey Johnson and Hope Ware also finished first in the meet. 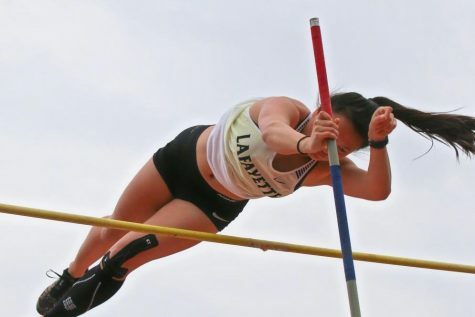 On the field, senior Haley Hudson won the triple jump while senior Ellie Schilling took home another first place title and broke her own school record in the pole vault with a 11′ 3″ jump. Water Polo: This week, the Lancers went 2-2 defeating Chaminade 16-10 and Pattonville 5-0 and falling to Kirkwood 12-7 and MICDS 16-8. The water polo team’s record is now 5-10, and they are led by junior Blake McCarthy who has scored 64 goals and 146 points and junior Mason Rega who has 29 assists. McCarthy is also the second leading scorer in the St. Louis.